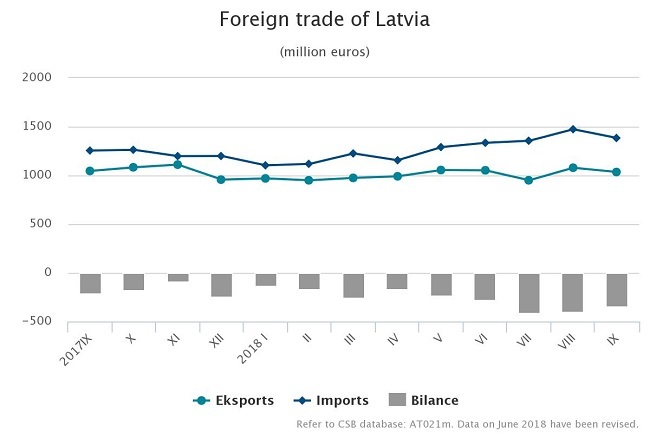 Provisional data of the Central Statistical Bureau show that in September 2018 the foreign trade turnover of Latvia amounted to EUR 2.42 bln, which at current prices was 5.1% more than in September 2017, of which the exports value of goods was 1.0% lower, but imports value of goods was 10.3% higher. In September, Latvia exported goods in the amount of EUR 1.03 bln, but imported in the amount of EUR 1.38 bln. Compared to September 2017, foreign trade balance has worsened as exports in total foreign trade amount decreased from 45.4% to 42.8%. Over the first nine months of this year, the foreign trade turnover of Latvia at current prices reached EUR 20.49 bln – EUR 1.75 bln or 9.3% more than in the corresponding period of 2017. The exports value constituted EUR 9.05 bln (an increase of EUR 695.0 mln or 8.3%), whereas the imports value – EUR 11.44 bln (an upturn of EUR 1.06 mln or 10.2%). Calendar and seasonally adjusted data show that, compared to September 2017, in September 2018 the exports value at current prices went up by 4.5% and the imports value by 17.6%, whereas, compared to the previous month, the exports value decreased by 3.4%, but the imports value increased by 2.3%. exports of live animals, animal products down by EUR 8.1 mln or 17.4%. imports of plastics and articles thereof down by EUR 4.5 mln or 6.1%. In September, the main export partners of Latvia in trade with EU countries were Lithuania (15.6% of total exports), Estonia (10.7%), Germany (7.4%) and Sweden (7.1%), whereas the main import partners were Lithuania (17.2% of total imports), Germany (9.4%), Poland (8.2%) and Estonia (6.8%). The main partner in trade with third countries was Russia, share of which in total Latvian exports in September accounted for 9.1%, but in imports – for 12.4%. Rise of exports of wood and wood products; wood charcoal in September 2018, as compared to September 2017, was affected by the increase in exports of round timber of EUR 9.4 mln or 91.2%. In turn, exports of machinery and mechanical appliances reduced, as exports of turbojets, turbopropellers and other gas turbines decreased by EUR 7.0 mln or 14.7%, but exports of vehicles other than railway or tramway rolling stock, and parts and accessories thereof fell as exports of passenger cars reduced by EUR 7.7 mln or 37.4%. Rise of imports in commodity group "aircraft, spacecraft, and parts thereof” in September 2018, compared to September 2017, was affected by purchase of aircrafts – increase of EUR 45.1 mln or 3.5 times, but imports of iron and steel grew as imports of flat rolled products of iron and steel rose by EUR 17.1 mln or 94.5%. In turn, decline in imports of passenger cars by EUR 10.9 mln or by 23.1% significantly influenced the total imports of vehicles other than railway or tramway rolling stock, and parts and accessories thereof.